OK, this has happened to me before: first, I tweet that I am going to stir something up in the kitchen. Something difficult, something ancient, something Puerto Rican. Then I realize that I actually have to do it. The effort sometimes is so great, it seems a shame I cannot share the meal (or drink, like the one I'm about to describe) with more people. So I then decide to post the recipe. This is what happened this week when after an innocent tweet, I took all the physical, emotional, and intellectual steps to make coquito -- a Puerto Rican drink which the New York Times recently described as “something like eggnog on a beach vacation" -- in a style I can share with the world. Not just with my wife (who is not Puerto Rican). Not just with my family (who are as Puerto Rican as they come). But also with you, bobo, who may be looking for a way to make this drink in your very own home. Maybe there's a muchacha you're trying to impress. Maybe there's a spouse you are trying to win back. Or maybe you got a bottle of rum as a gift in a Secret Santa exchange and are wondering how to put it to better use (classier than a Rum & Coke, more serious than a Piña Colada). Whatever it is, I am here to serve, and you're gonna make coquito this Christmas. And no worries about the timeline -- the Puerto Rican Christmas is more a season than a holiday, and it ends on January 5th or 6th, depending on which side of the party you are on. Making coquito is messy: Seriously. Lots of sticky substances. Various and sundry liquids. Many glass receptacles, which tend to drop when people are sampling the stuff. Twenty years ago, I raided my parents' refrigerator for a small sample -- un traguito, as my drink-happy Uncle Israel used to say -- on a cold Winter night when everyone was asleep. 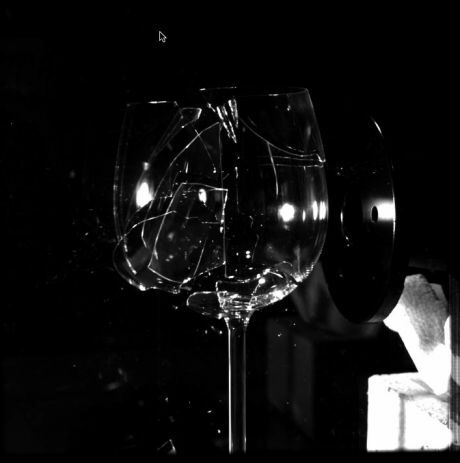 I dropped the fancy half-gallon vessel on the kitchen floor, and it took three full days to clean up the debris, which splattered everywhere. It took way longer to get my family to forget the incident, so I strongly urge you to map out your coquito cleanup plan well in advance. But thank God for modern conveniences, bobo -- I've got you covered with a Web 2.0-style approach that will not fail. Seriously. Making coquito is dangerous. Most recipes for coquito fail to mention what happens to coquito chefs -- the coquiterros, if you will -- midway through the preparations. They tend to get distracted. They get confused about the exact amount of rum they are supposed to add. Because the resulting mixture never quite tastes like a very strong drink ("mijo, this tastes good .. . dame otro mas"), it's a quick sprint to partytown. Three recommendations here: (1) make sure you have a designated driver; (2) prepare two batches, and make sure that one is far stronger than the other; (3) if anyone, for any reason -- OK, perhaps your aunt from Long Island -- starts to dance the pachanga, give her a non-alcoholic Coco Rico. That should calm her down. Making coquito is almost sacred ... don't mess with it. This is a good rule for most Puerto Rican cooking. But it applies with special force for coquito, a drink that has been passed down so long -- from generation to generation -- that it's almost sacred. Not sacred with a capital S, of course. This is not the blood of Jesus Cristo, the ultimate focus of Christmas celebrations. But it is the condensed milk, evaporated milk, coconut cream, egg yolks, cinnamon, vanilla extract, and yes, rum, of Jesus Melendez, or whatever cunning Latino invented this concoction ages ago. Be respectful, and understand your place in this long, unbreakable chain of being. And remember to cut off your aunt. Note: as always, click on the photos to see the truth up close. ONE: THE RUM. Before we get too distracted, it would help to do a quick review of the ingredients. First, of course, there's the rum. We got this bottle at a Von's in Carpinteria, on our trip from SF to LA a few days ago. It was a good sign -- Carpinteria means "carpenter's workshop" in Spanish. 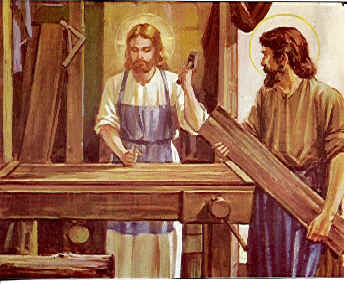 (Quick: who is the most famous carpenter in history?) With a Safeway card, the rum came out to less than $15. For real. Merry Christmas. You're welcome. Technically we only need 750 ml of rum, but as I noted above, we can anticipate distraction and confusion over the required amounts. One half-gallon of white rum. Check. Condensed milk -- the most outrageously sweet stuff in the world. South Americans use it to make dulce de leche. Should be illegal, but it's not. One can of condensed milk. Check. Evaporated milk. Doesn't matter if the brands are different. And white label is cool. Hardly anyone cooks with this anymore, so grab it wherever you can find it, and stockpile it in preparation for the End of Days. It will come in handy. Four 12 oz. cans of evaporated milk. Check. Coconut cream. Oh, and it needs to be Coco Lopez. No substitutes here. Sorry, but you want to make the real deal, not something they'd serve you at Trader Vic's. Right? Right. Two 15 oz. cans of coconut cream. Check. Eggs. OK, let me break this to you s l o w l y. You going to drink ... raw ... eggs. But don't freak. It's not like how Rocky drank raw eggs. These eggs will be so deeply mixed, beaten, and blended into all the other stuff above that you won't likely notice them. But more bad news, if you are inclined to think about your health. We are going to separate the eggs, and get rid of the whites. Get over it -- have a drink (8 oz. 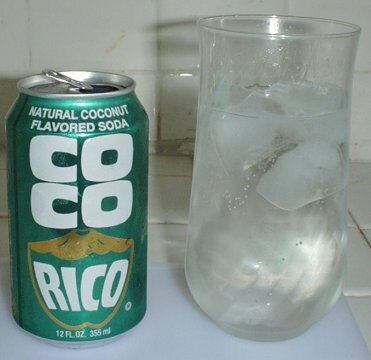 of Coco Rico, 3 oz. of rum). Six egg yolks -- well beaten. Check. Cinnamon and vanilla. OK, this is to make it all go down like real egg nog. Nothing special, but required. Just make sure that the ingredients were purchased in recent history. Many people I know have spice museums, not spice racks. I'd worry about that more than the raw eggs. Two teaspoons of cinammon. Check. Two teaspoons of vanilla extract. Check. By now, you will have realized that you have close to one gallon of stuff, and a confusing array of sticky and sloppy mixtures in different size containers. And there's the blender problem. If you are an ordinary mortal, you are somehow going to have to divide up all these ingredients into batches. I've seen many a coquiterro break down at this point. My recommendation is what I call 4X4X2 strategy. And as with so many things in the kitchen, you need to follow the liquor to execute this strategy effectively. Start by attempting to pour the 750 ml of rum evenly into four glasses, like this. You'll see how hard this is to do, but how easy it is to add a little extra rum to even out the glasses. Never mind. Follow your instincts. Next, pour one glass of rum into the blender, and add exactly one fourth of the remaining ingredients. That means exactly one can of evaporated milk, one half can of the coconut cream, one quarter can of the condensed milk, one quarter of the raw egg mix, one half teaspoon on the vanilla extract, one half teaspoon of the cinnamon. Blend, then pour into one half gallon container. Repeat three times, filling both containers. 4X4X2. Get it? Divide all the ingredients by four, pass everything through the blender in four batches, then pour everything into two half-gallon pitchers. There are several opportunities here to get confused or deliberately mess with the rum amounts. But the best opportunity to adjust the amount of rum is the first tasting. And here's what you do. Pour two traguitos -- one from each pitcher -- into small glasses. Sample each. If one of them feels weak, leave it alone, but add eight ounces more to the other and label it "premium." You'll realize later why this is a good idea. It will allow you to manage your crowd like the best Puerto Rican bartender, protecting the sheep while taming the lions. Plus, it'll be more fun. Who knows, you may even get lucky (you are looking good in that guayabera , nene, in those new shoes, nena), and be present enough to enjoy it. You know it's true. (1) Declare at the outset that you will do all the preparation. This will get everyone in the proper (e.g., guilty) frame of mind to help when the time for cleanup arrives. Works every time. (2) "Crowdsource" the cleanup. After the first tasting, declare that the second phase of the prep is an old-fashioned group-driven cleanup while the coquito chills for the first real round. Remember that scene in "Witness," in the Amish country, when the whole community got together to build and raise a barn? Afterwards, they all sat down to enjoy a meal. But back to the present, in your kitchen: instead of a barnraising, this a barn cleaning, or a manger cleaning, to be consistent with the Christmas theme. This will inspire your guests to work for their coquito, which is only right and proper. Right? Right. (3) Automate the cleanup, to the extent you can. Hey, it's the 21st century, and despite the Web 2.0 vibe, the last thing we want to see is a bunch of Latinos slaving in the kitchen. That's right, bobo. We need a robot. This one -- the Ca-Roomba -- is special. Soon it may be programmed to hunt down pernil, gandules, and Coco Lopez (no substitutes). I'm serious. Of course, don't forget to raise a glass yourself. You are now part of that unbreakable chain of rice and being, and you deserve a real trago of the brew ... at least. And you are already in a position to pass it down ... premium, regular, or virgin, at your well-earned discretion. Vaya con Dios, coquiterro, y Feliz Navidad. And don't forget to cut off your aunt. She's starting to hit on your nice single friends. This is great...I was just having this conversation w/ my better half that some of the best "foods" to me I often don't know where to get them or make, and wait until they "find" me. I am so making this either tomorrow or Sunday. Will let you know how it comes out. I made half a gallon...not bad...not bad at all (had to replace w/ coconut milk vs coc. cream - otherwise it would of been excellent). omg... now I know what I'm doing for New Year's. Take these out into the square and start handing them around (or maybe not). Coquito was a huge hit on New Year's Eve. We made a half-gallon the day before and refrigerated it, further blending the flavors. We used Castillo Silver rum. Stong self-dicipline was needed to avoid excessive sampling during the process :) Blended everything in one large bowl, then poured it into a growler to take to the party. Thanks for sharing the recipe -- and the inspiration to make it! The students have to know the facts just about this post, because it’s very good to search for custom writing and already written essays at the writing service and this is really possible to buy an essay in such situation! I was just passing by to this post i enjoyed reading this post. We turn our attention away from our own defects, and when we are forced by untoward events to consider them, find it easy to condone them. Maybe there's a muchacha you're trying to impress. Maybe there's a spouse you are trying to win back. Or maybe you got a bottle of rum as a gift in a Secret Santa exchange and are wondering how to put it to better use (classier than a Rum & Coke, more serious than a Piña Colada).